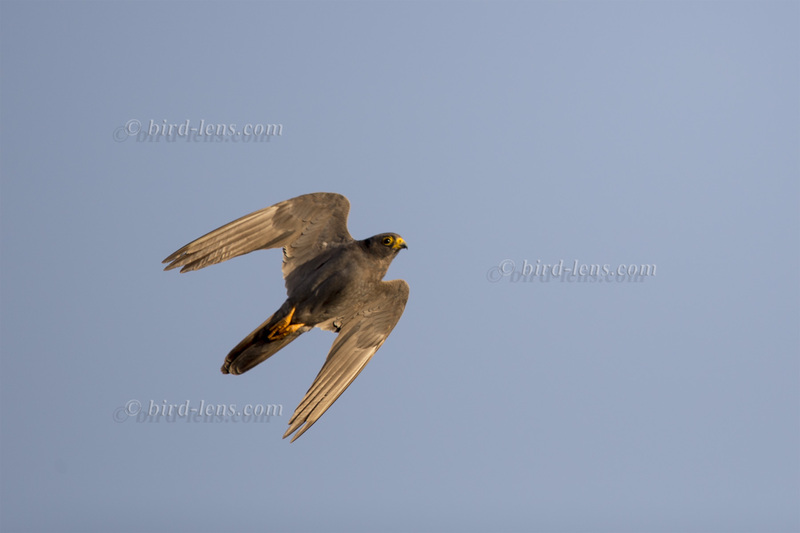 The Sooty Falcon (Falco concolor) is the killer of passerine birds on the islands along the red sea coast of Egypt. When the Sooty Falcon recognizes a bird flying overhead, the Sooty falcon rapidly takes to the air, accelerating above its prey before making a low dive and seizing it in its talons. The adult birds with its mainly uniform grey, with a bluish tinge in the case of the male makes it an attractive bird of prey with long, slender wings and an elongated tail. A summer holiday trip with some birding activities in the Gorgonia Beach Resort 48 Km South of Marsa Alam City and only a few Km north of the (for birders) highly recognized Shams Alam Beach Resort was very successful in observing the swift flight of these beautiful small falcon against a steel-blue sky. The area is perfect by having several hundred pairs of Sooty Falcon breed nearby on the islands of the Wadi el-Gemal National Park. Falco concolor is quite a commonly observed breeder on the islands of Wadi el-Gemal and the Hamata Archipelago. Birds return to Egypt from their wintering grounds in Madagascar in April, start breeding in between August and November and return to south-east Africa from late October. Landing on islands with breeding colonies during the breeding season is prohibited. But it is easy to charter a boat to have excellent observations from boats surrounding the breeding islands. Sooty Falcons are specialists in migratory bird hunting. It must be noted, that the Sooty falcon is generally most active at dusk and dawn. At that time of the day you might see a falcon perched on rocks or vegetation like a dead tree trunk, scanning the sky for passing migrant birds. During the day the bird sometimes perching openly on rock or low shrub, but more often it is out of sight, as the falcon is concealed in the shades of rocks or vegetation. Particularly at dusk the falcon is hawking for birds, insects and even bats. When a prey flies overhead, the Sooty falcon starts from its perch, accelerating above its prey before killing it from above. Species taken in flight include Blue-cheeked Bee-eater (Merops persicus), European Bee-eater (Merops apiaster), European Roller (Coracias garrulus), Eurasian Hoopoe (Upupa epops) and a variety of passerine birds as warblers. Sooty Falcons are said to breed in unvegetated, rugged desert mountains with some cliffs and canyons, too. But during our stay we felt, that all Sooty Falcons came from small rocky islands offshore, foraging over the islands as well as over the of mainland over sandy beaches, agricultural land or oases. This species population decline is suspected on the basis of fragmentary population figures and surveys. In order to satisfy the growing demand for top shots of the rarer species of Western Palearctic, Bird-lens.com has undertaken dedicated trips to nearby and distant bird areas. This is to be able to do anything to provide excellent images of the birds of the Western Palearctic. Sometimes the yield of images is enriched by bird species, which are very unlikely to show-up in the Western Palearctic. The results in images even of rare Western Palearctic birds are very good. The beautiful images of the blog are only a first impression of what you will find in behind “Picture Shop” very soon. Simply contact bird-lens.com if you need an image of a bird before the newest images are online. Is it easy to Get good pictures of Sooty falcon at this place. Thinking og good pictures at close range of sitting Falcons and flight pictures. How is it to travel to this region? Fligt to Kairo, and then the route further? Is it safe to travel in this region? I think, most question are answered in this blog http://www.bird-lens.com/2016/11/20/tripreport-southern-red-sea-coast-egypt-september-october-2016/. Obviously it is best to fly to one of the Red Sea airports – best is Marsa Alam. Driving is not permitted – as far as I think. So you have to rely on taxis, which makes close-by accommodation necessary. Crucial is the time window to get good shots of the Sooty Falcon. The bird is quite wide spread along the Red Sea coast.